"It's Yukon King, swiftest and strongest lead dog�blazing the trail for Sgt. Preston of the North West Mounted Police in his relentless pursuit of law breakers!" When the winds and the will of evil men are equally wicked, a man without loyal friends isn't likely to live for very long. 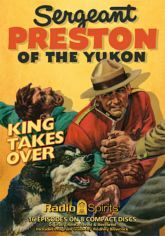 On the frozen plains, there is no more allegiant ally, more constant companion, more ferocious fighter than the one who travels with William Preston through Dawson, Selkirk and points north: the wonder dog, Yukon King. It's cold in the Klondike, but Preston and King are hot on the trail of the masked and the murderous! Includes 16 digitally restored and remastered episodes, and a Program Guide by Rodney Bowcock.